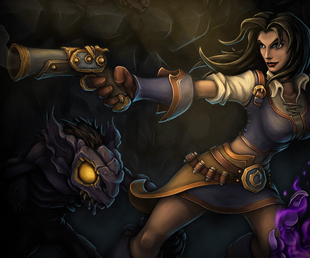 If you've been having troubles with Torchlight 2 recently, there's a Steam key available. Travis Baldree of Runic Games thinks he knows what's to blame for some players' Torchlight 2 problems: Windows 8. The problem only affects some PC players, but blocks them from playing altogether, as it requires activation but does not allow the affected user to input any codes. "Normally, when Reactivation is required, it automatically takes care of itself," says Baldree. In the rare cases where there is a problem, Runic has tools to fix it, but those tools aren't working this time. "Our current suspicion," says Baldree, "is that something structural has changed in Windows 8 (or during the upgrade process) which fundamentally breaks the license." As the problem doesn't affect all Windows 8 users, it is proving particularly difficult to isolate. However there is a temporary solution. Runic is offering Steam keys to all affected parties. To make a claim, shoot an email to [email protected], and be sure to include a receipt from the purchase as well as information about your OS and setup.